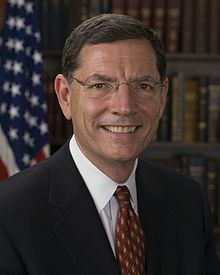 John Barrasso (born July 21, 1952) is the junior United States Senator from Wyoming. He is a member of the U.S. Republican Party and has been in Senate since June 25, 2007. He was in the Wyoming Senate from 2003 to 2007. Barrasso was born on July 21, 1952 in Reading, Pennsylvania. He graduated from the Georgetown University. He is married to Bobbi Brown. They have three children. ↑ 1.0 1.1 "Barrasso, John". Office of Art and Archives and Office of the Historian, The United States Congress. Retrieved July 17, 2015. This page was last changed on 3 January 2019, at 18:08.